Glastonbury is a village situated in a secluded spot in the marshes, though it can be reached both on horseback and on foot. It affords pleasure neither by its situation nor by its beauty. Located in Somerset, Glastonbury Abbey is a site of popular myth and legend. In the Middle Ages, the Abbey claimed to have been founded by Joseph of Arimathea, and it is also the legendary burial site of King Arthur. In the 1129, the monks at Glastonbury commissioned William of Malmesbury to write the official history of the Abbey, as well as the life of Saint Dunstan, who was the first abbot of Glastonbury (and later became the Bishop of Worcester, Bishop of London, and Archbishop of Canterbury). William’s original version of De antiquitate Glastoniensis ecclesie has not survived. The text is extant in two thirteenth-century manuscripts. Both manuscripts include several interpolations relating to the legend of Joseph of Arimathea, the relics of Saint Patrick and Saint Dunstan, and the exhumation of the bodies of Arthur and Guinevere. These interpolations were introduced into the text between 1171 and 1247. In the 1130s, the Welsh cleric Caradoc of Llancarfan, who was a contemporary of Geoffrey of Monmouth, composed the Vitae Gildae for the Glastonbury monks. Caradoc claims that the sixth-century British monk ‘Gildas Sapiens’ – or ‘Gildas the Wise’ – wrote De excidio et conquestu Britanniae while at Glastonbury. Caradoc was also the first writer to associate King Arthur with Glastonbury, and the Vitae Gildae includes the earliest version of the story of the abduction of Guinevere. By the late twelfth century, Glastonbury Abbey ‘was in a state of financial and ecclesiastical crisis’. In 1184, a great fire at Glastonbury destroyed the monastic buildings. Reconstruction began almost immediately, and the Lady Chapel was consecrated in 1186 or 1187; however, work on the abbey was postponed by the death of Henry II (1189), which ended financial support and royal patronage. In order to raise funds, the monks of the abbey commenced a series of propaganda exercises, and used holy relics and the bodies of saints to promote Glastonbury as place of pilgrimage. 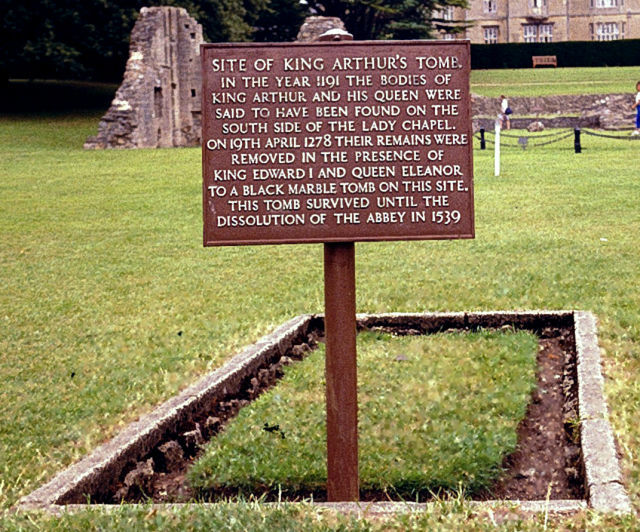 The bodies of Arthur and Guinevere were discovered in the cemetery at Glastonbury in 1190 or 1191. In both of his accounts of the exhumation, Gerald of Wales recalls how a Welsh bard had told Henry II about the location of Arthur and Guinevere’s bodies. Gerald was the first to explicitly identify Avalon – the resting place of Arthur – with Glastonbury. Arthur and Guinevere’s bodies were re-exhumed in 1278. At Easter, Edward I visited the Glastonbury with his wife, Eleanor of Castile, and on the 19th April he instructed the bodies to be moved to the high altar. The exhumation asserted that Edward I ‘was a legitimate successor to the Arthurian imperium’. Following the conquest of Wales in 1282, Edward took possession of Arthur’s crown in 1283, and held a Round Table at Winchester in 1284. His grandson, Edward III, also visited Arthur’s tomb with his wife, Philippa of Hainault, in 1331. The legend of Joseph of Arimathea was popularised in thirteenth-century French Arthurian romance. In the first part of his trilogy of Arthurian romances, Robert de Boron describes how Joseph of Arimathea used the Holy Grail to catch the last drops of blood from Christ as he hung on the cross. Robert also claims that the descendants of Joseph brought the Grail to Britain. In the mid-thirteenth century, the story of Joseph of Arimathea was interpolated into William of Malmesbury’s De antiquitate Glastoniensis ecclesie. These revisions asserted that Joseph was the original founder of Glastonbury, which subsequently bolstered the reputation of the abbey. John of Glastonbury also expanded the story of Joseph in his Cronica sive antiquitates Glastoniensis ecclesie, using the apocryphal Gospel of Nicodemus – also known as The Acts of Pilate – and the first part of the Lancelot-Grail cycle, L’estoire du Graal, as his main sources for the apostle’s life. The legend of Joseph of Arimathea also survived into the later middle ages. In the fifteenth century, John Hardyng included the story of Joseph of Arimathea in the two versions of his Chronicle (1457 and 1464). As Edward Donald Kennedy points out, ‘[t]he account of Joseph afforded Hardyng an ideal story to use to counter Scotland’s claims to preeminence as a Christian nation’. Hardyng’s Chronicle also contains a grail quest – which is unprecedented in the chronicle tradition – and Galahad’s achievement of the Grail occurs before Arthur’s war against Rome and the final battle between Arthur and Modred. Gerald wrote two accounts of the exhumation of King Arthur and Guinevere at Glastonbury. The first account is contained in De principis instructione (c. 1193), while the second – and more detailed – account is included in Speculum ecclesiae (c. 1216). Gerald claims that he was an eyewitness of the exhumation, but Richard Barber has challenged his claim to authority. Ralph was abbot of Coggeshall, near Colchester in Essex. He wrote his Chronicon Anglicanum in around 1223, and the entry for 1191 includes an account of the exhumation of Arthur and Guinevere. Adam was a monk of Glastonbury Abbey in the thirteenth century. He wrote a history of the abbey entitled Historia de Rebus gestis Glastoniensibus, which is a continuation of William of Malmesbury’s De antiquitate Glastoniensis ecclesie from 1126 to 1291. Adam was also an eyewitness of Edward I’s visit to Glastonbury in 1278 when the tomb of Arthur and Guinevere was opened and their bones were moved to the high altar. Written around 1200, the Vera historia de morte Arthuri is extant in four manuscripts. Two manuscripts – London, British Library, Cotton Titus A. xix and Oxford, Bodleian Library, Digby 186 – include materials relevant to Glastonbury, such as excerpts from the works of William of Malmesbury and John of Glastonbury. In Paris Biblioteque de l’Arsenal, 983, the Vera historia is interpolated between chapters 178 and 179 of the First Variant version of the Historia regum Britanniae. Richard Barber and Michael Lapidge have suggested that the Vera historia was originally composed in Wales. The Cronia survives as a complete text in seven manuscripts. The main sources for John’s Cronica are William of Malmesbury’s De antiquitate Glastoniensis ecclesie and Adam of Damerham’s Historia de Rebus gestis Glastoniensibus. John’s Cronia is ‘highly derivative’, and he uses a selection of chronicles, hagiography, and romance to construct a history of Glastonbury Abbey. What are the motivations for the exhumation in the accounts by Gerald of Wales, Ralph of Coggeshall, and Adam of Damerham? What is the significance of royal and ecclesiastical authority in the different accounts of the exhumation of Arthur and Guinevere? How does Arthur’s tomb function as a site of public memory? Philip Schwyzer classifies the exhumation of Arthur as a sub-genre of the inventio topos that participates in an act of ‘colonial archaeology’. How are the materials and artefacts of British history appropriated in these texts? Catherine Clarke argues that local landscapes are ‘central to the fashioning of monastic identity and its connection to images of the nation’. How is the landscape of Glastonbury represented in these texts? Why does Gerald of Wales undermine of the myth of Arthur’s return? How do the texts – particularly the Vera historia and John of Glastonbury’s Cronica – engage with models of Arthurian history in chronicle and romance? How do Gerald of Wales and John of Glastonbury align the story of Arthur’s death by Geoffrey of Monmouth with Glastonbury? Can the relocation of Arthur’s resting place to Gwynedd in the Vera historia be read as a response to the growth of Glastonbury legends in the 1190s? William of Malmesbury, Gesta Pontificum Anglorum: Volume One: Text and Translation, ed. and trans. by M. Winterbottom with the assistance of R. M. Thomson (Oxford: Clarendon Press, 2007), 2.91.1. Valerie M. Lagorio, ‘The Evolving Legend of St Joseph of Glastonbury’, Speculum, 46 (1971), 209-31 (p. 210). John Carmi Parsons, ‘The Second Exhumation of King Arthur’s Remains at Glastonbury, 19 April 1278’, Arthurian Literature, 12 (1993), 173-77 (p. 176). Edward Donald Kennedy, ‘John Hardyng and the Holy Grail’, Arthurian Literature, 8 (1989), 185-206 (p. 197). James P. Carley, ‘Introduction’, in The Chronicle of Glastonbury Abbey: An Edition, Translation and Study of John of Glastonbury’s Cronica sive Antiquitates Glastoniensis Ecclesie (Woodbridge: Boydell Press, 1985), pp. xi-lxii (p. xi). Philip Scwhzyer, Archaeologies of English Renaissance Literature (Oxford University Press, 2007), p. 55. Catherine A. M. Clarke, Literary Landscapes and the Idea of England, 700-1400 (Cambridge: Brewer, 2006), p. 68.